Note: You may click on any image to view a larger version. 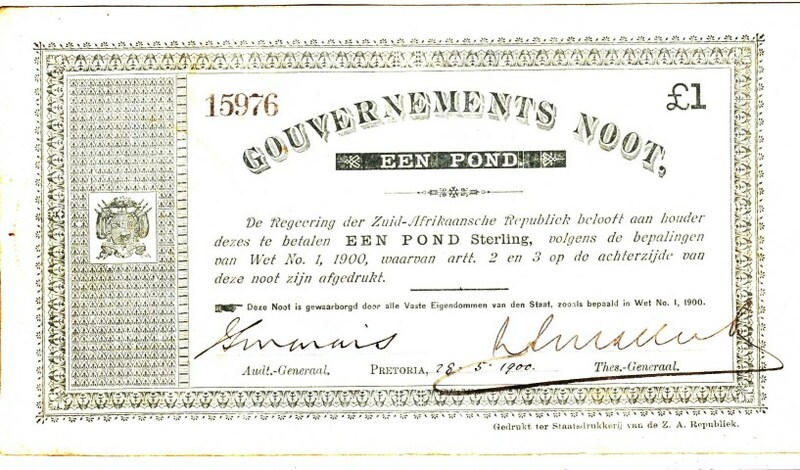 'Een pond' is 'one pound' in Afrikaans, the dialect of Dutch spoken in South Africa. 'Oom Paul' means 'Uncle Paul', and was an affectionate nickname for President Paul Kruger of the Zuid Afrikaansche Republiek (South African Republic). This program is actually about two 'een ponds' in my collection: one a gold one pound coin dated 1894, and the other a one pound Government Note issued in 1900 during the Boer War. These two items represent history with lessons to teach us now because the Boer War was a turning point in the history of the British Empire, in an ideological sense perhaps the beginning of the end of the Empire. The Z.A.R. 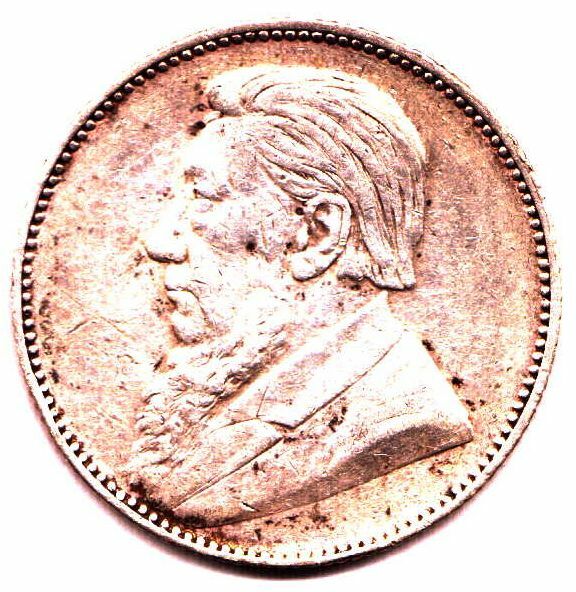 gold pound I have is very well circulated, so I also illustrate an 1897 sterling silver one shilling coin (20 shillings = 1 pound) with a much less worn portrait. 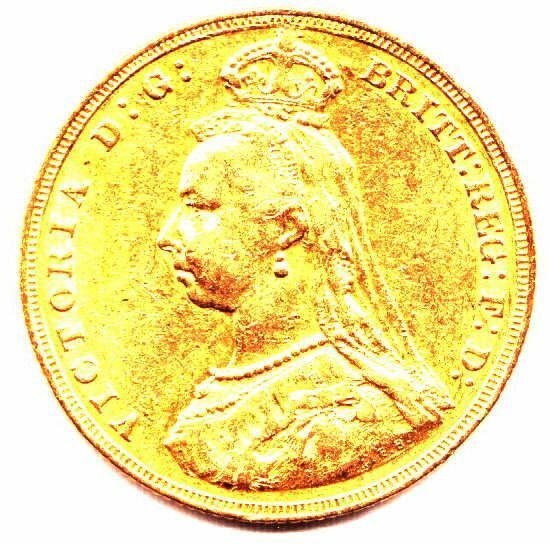 (Most numismatic, as opposed to bullion, gold coins on the collector market these days are in relatively high grade because most of them sat in bank vaults backing up issues of paper money rather than physically circulating in people's pockets. 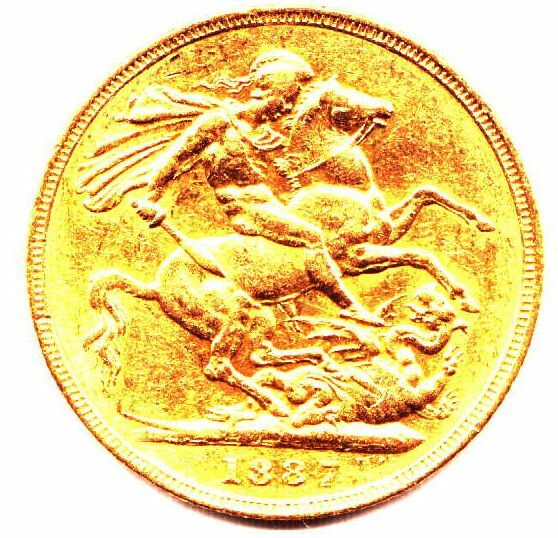 In only a few places in the world and times in history have substantial quantities of gold coins actually been used in daily retail commerce - late 19th century South Africa being one of them. In fact, this piece has tooth marks [4:00 - 5:00 o'clock on the portrait side] from somebody testing the gold's softness by biting it!) These portraits of Oom Paul personify the values of the Boers, hardheaded, no-nonsense, stubborn Dutch farmers devoted to their independence. 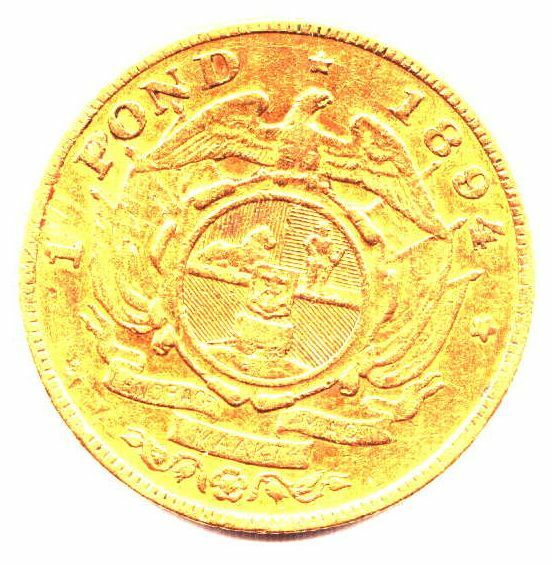 The other side of the gold pond shows a more elaborate version of the national coat of arms with an eagle above and flags draping the sides. Consequently, to show the details of the symbols more clearly I show an 1896 silver two shilling piece with a larger version of the arms because it doesn't include the eagle and flags. In the center is a shield with an anchor, probably representing commerce, and in the upper left a recumbant lion, probably symbolizing Africa in general. At the upper right is a standing figure of a man in a broad brimmed hat holding a rifle; he represents a 'Trekboer'. At the bottom is the kind of covered wagon used by the Trekboers for 'The Great Trek'. In Dutch, 'boer' simply means 'farmer', and 'trek' means travel, journey, or more specifically in this case, migration. To understand the significance of The Great Trek, a little background of earlier South African history is necessary. South Africa was first seen by Portuguese explorers in the late 15th century, who named the end of the continent the 'Cape of Storms'. After confirming that it was the last obstacle on their route to India, they renamed it 'Cabo da Boa Esperanca' (= Cape of Good Hope). However, the Portuguese didn't colonize the Cape area because they developed much larger colonies in Angola on the west coast and Mozambique on the east coast of Africa. In the early 17th century (incidently toward the end of the reign of that great Mughal Emperor of India, Jalal eddunya wa eddin Mohammed Akbar Padshah ;-), the Dutch invaded the Indian Ocean and began taking over the Portuguese colonies. By the middle of the century the Dutch realized the necessity for a supply base for ships of the Netherlands' United East India Company, so a colonizing fleet was sent to establish Cape Town in 1652. Like the Netherlands itself (and also like the New England colonies), the Cape colony was a refuge from religious persecution, so some French Huguenots and German Protestants joined the Dutch settlers over the next century and a half. When the French Revolution started in 1789, middle class people and intellectuals throughout Europe had been inspired by the American Revolution to advocate democracy; monarchies threatened by democracy actively suppressed democratic movements long before a coalition of threatened monarchies attacked the First French Republic. Partly out of ideological zeal, and partly in self defense, the French 'exported' their revolution, supporting democratic movements in other European countries. In 1795, the democratic faction in the Netherlands proclaimed the Batavian Republic. That made the Dutch an ally of France, and therefore an enemy of Great Britain. 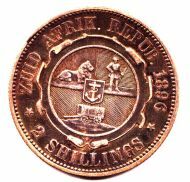 That was all the excuse the British needed to proceed immediately to seizing Dutch colonies from Surinam in South America to Ceylon in the Indian Ocean; Cape Town was a particularly strategic naval base for the British Royal Navy. Until the final defeat of the French Empire in 1815, the British occupation of the Cape Colony was primarily military, but afterwards the British began to establish their own civil administration and introduce the Anglican Church. The Dutch 'Afrikaners' resisted, and when push came to shove, they packed up their wagons and began the Great Trek in the mid 1830's, moving into the interior beyond British control. The British eventually moved in and established a protectorate in 1848. 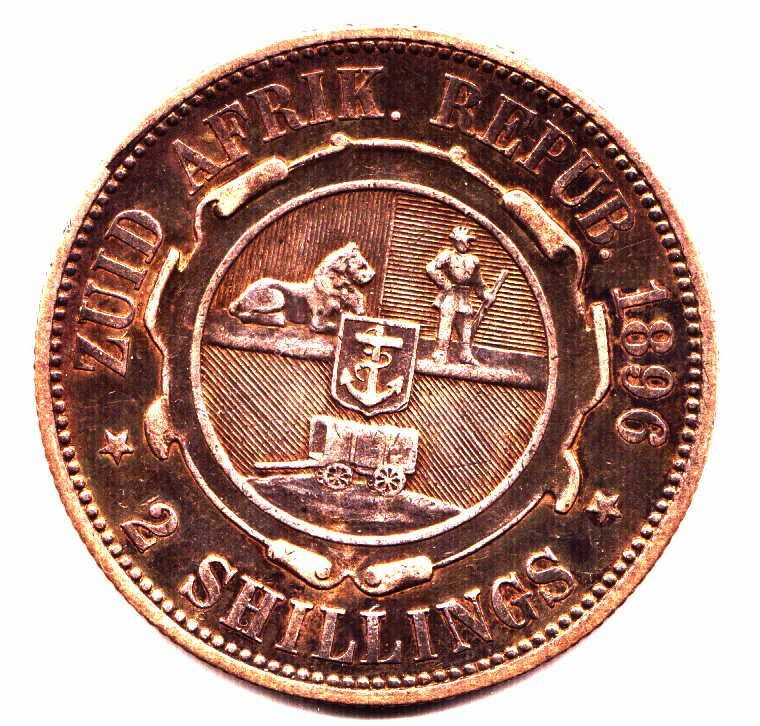 After a war of independence the British recognized the Zuid Afrikaansche Republiek in 1852 in the Transvaal (the territory north of the Vaal River) and the Orange Free State (south of the Vaal) in 1854 (the House of Orange is the Royal family of the Netherlands, thus symbolizing the Trekboers' Dutch heritage). The Great Trek took place around the same time that American pioneers were coming over the Oregon Trail in the Oregon Territory. However, the Oregon pioneers had a much easier time of it because an estimated 90% of the First Nation people (Amerinds) living in the Oregon Territory were wiped out by an epidemic (modern historians suspect it was malaria brought by the crews of fur traders' ships) in a two year period just before the first large wagon trains came over the Oregon Trail in 1834. In South Africa, the Zulus, with a huge army and efficient military organization were actively building their own empire by conquering other tribes and taking over their territory. The Trekboer on the Z.A.R. coat of arms symbolizes that the Afrikaners had "the three G's" - 'God, guts, and guns'; their faith in God gave them the guts to use their guns to take the land, often over ferocious opposition. However, internal political conflict among the Boers resulted in near civil war, so that by 1864 the British were able to re-establish their protectorate over the Z.A.R. In 1880 the Afrikaners rebelled and drove the British out again. One of the leaders of this rebellion, Paul Kruger, was elected President of the Z.A.R. in 1883, and was re-elected for three more five year terms, serving until the Boer War. The Z.A.R. moved to restrict citizenship, requiring, for example, that an immigrant had to live in the Z.A.R. for fifteen years before qualifying for the right to vote. The British protested such blatantly anti-democratic tactics. When the Afrikaners wouldn't budge, in 1896 the British supported 'Jamison's Raid', an uprising of English-speaking residents. The Z.A.R. crushed the rebellion; the British demanded reparations. Negotiations dragged on and eventually broke down. In 1899, war broke out between the Afrikaners and the most powerful Empire in the world. To paraphrase a famous poem about the Battle of Lexington and Concord, when the British Empire met similar resistence, "Here once the embattled farmers stood/ And fired the shot heard 'round the world". Initially the army of the Z.A.R. was successful, driving the British back into Natal and the Cape Colony. However, the British were able to summon the resources of their entire empire, pouring troops and supplies into South Africa, ultimately deploying a force of 200,000 against 95,000 Boers. President Kruger travelled to Europe, unsuccessfully seeking aid from other countries; he was never able to return, dying in exile in 1904. The Z.A.R. Government Note is the oldest African note in my collection. There were a few issues of paper money in Africa before the 20th century, but most of them are quite scarce or rare, including beautifully engraved notes of the Zuid Afrikaanische Nationalbank showing a half-length figure of President Kruger. 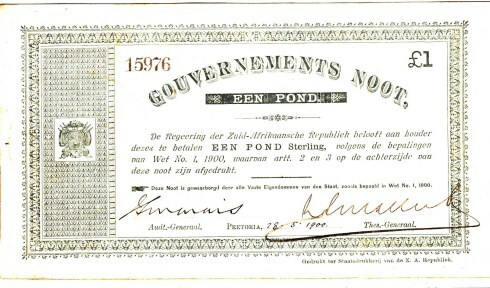 The Government Notes of the Boer War are more collectible, but still by no means common. An emergency issue, they were locally printed by the Government Printing Office on thick paper with an embossed seal that doesn't show well on this example. They were type-set with no engraving. The back of the note just has the text of the decree authorizing the issue. The note is hand signed and dated in Pretoria May 28, 1900. That was just a little more than a week before Pretoria fell to the British. The largest gold mine in the Transvaal was within the city limits of Pretoria. Having captured the Capitol, the British assumed that would end the war - but the Afrikaners wouldn't give up, turning to guerilla warfare. The war dragged on for another two years. Initially, as another one of the 'splendid little wars' of the Pax Britannica, this war was popular on the homefront. From 1815 to 1914, there were no major wars in Europe, partly because the British were able to manage balances of power, but mainly because Europeans were busy conquering the rest of the world instead of fighting each other. These colonial wars, such as the Zulu War of the 1880's, where small numbers of British troops defeated large numbers of ill-organized 'heathens' with inferior military technology, were seen as heroic. Building the Empire was justified as 'bearing the white man's burden' of bringing civilization to the 'lesser races', including democracy, the rule of law (with courts with judges in long white wigs), and the Christian religion. However, the Boer War was more morally ambiguous. The enemy were white people who were already Christians. While the British claimed to be fighting for the principle of universal adult (white) male suffrage, the Boers were fighting for the right of self-determination as one of the main benefits of democracy. In the early stages of the war, the British news media portrayed it as an adventure. For example, the then young Winston Churchill covered it as a war correspondent; he was captured by the Boers and managed a daring escape. The British enjoyed the image of the underdog during the siege of Mafeking, where a small British garrison held off larger Afrikaner forces for months through the ingenuity and resourcefulness of their commander, Colonel Robert Baden-Powell. He used young boys as couriers and observers so successfully that after the war he developed the idea into the Boy Scout movement. However, when the Boers were forced to resort to guerilla warfare, the situation turned ugly. Without being able to engage the Afrikaners directly with their superior force, the British had to turn to a scorched earth policy to deny supplies to Boers. The British secured the country piece by piece by setting up long fences with frequent guard towers. While the Boers went into the bush to harrass the British, they left their wives and children to run their farms; the British rounded up the women and children and put them in concentration camps while they destroyed the farms. Concentration camps were a new concept, although the British didn't invent it. The first use of concentration camps was by the Spanish in Cuba in suppressing an independence rebellion in 1895. World opinion was offended, but muted, as the Spanish were considered to be a degenerate empire and the Hispanic Cubans a 'lesser race'. However, when Afrikaner white women and children suffered in concentration camps, Europeans and the English speaking world were shocked. The British had no experience with concentration camps; they didn't provide adequate shelter, food, or medical attention. In concentrating people, the camps spread disease. Thousands died. Public opinion began to question whether the ends of the war justified the means - and just what the real goals of the war were. In this context, it is particularly interesting the role played by Mohandas Gandhi. Half a century later, Gandhi, 'the Mahatma' ('Great Soul') would be known worldwide as the personification of peace and justice through moral protest. He pioneered the tactic of non-violent civil disobedience which inspired Martin Luther King to employ the same method in the United States. Gandhi was regarded as being primarily responsible for shaming the British into granting independence to India, their richest possession, the 'Jewel in Crown' of the Empire - and that truly marked the beginning of the end of the British Empire. However, Gandhi's political activism actually began in South Africa. In 1888 he went to London to study at the Bar, and after getting his law degree, instead of returning to India, he went to Durban, Natal, to practice law. That made sense because the British brought large numbers of Indians into Africa and other parts of the Empire as indentured laborers. However, Gandhi's first big case was between two Indian 'shroffs' (native bankers) living in Johannesburg in the Z.A.R. The opening scene of the beautiful biographical movie "Gandhi", shows a train steaming across the South African veldt at dawn. At the border of the Z.A.R., an Afrikaner conductor came on board and told Gandhi that he couldn't ride in the first class carriage because he wasn't white. Gandhi protested that he'd bought a first class ticket in Durban and therefore had a right to ride in first class; the conductor physically threw him off the train, and Gandhi had to take a stagecoach the rest of the way to Johannesburg. While living in Johannesburg for six months working on this long complex case, Gandhi took a daily walk to the edge of town; his route took him in front of President Paul Kruger's house, where there was always a policeman standing guard. When Gandhi approached, the policeman told him that he had to walk in the street because the sidewalk was only for white people. Gandhi insisted on his human right to walk on the sidewalk, and the cop physically threw him out into the unpaved street. Every day for six months, Gandhi asserted his right to walk on the sidewalk, and every day he got thrown out into the street. Back in Natal, Gandhi later became involved in the Congress Party, the main organization agitating for human rights for Indians and the independence of India. When the Boer War broke out, Gandhi advocated that the Congress Party support the British side in the war to show that, as loyal subjects of Queen Victoria, Indians deserved the same rights as Englishmen. However, the British would not allow Indians to serve in the military (they hadn't trusted Indians with guns since the India Mutiny forty years earlier). Consequently, Gandhi organized an all-Indian ambulence corps. Congress Party volunteers were trained in first aid, and horse-drawn ambulences were bought. The spectacle of unarmed Indians dashing out into the line of fire to pull wounded British soldiers off the battlefield, give them first aid, and take them to field hospitals impressed the British troops. However, the British government found it in its interest to remain steadfastly unimpressed. The British public had to think about it - and that was Gandhi's goal. The last Boer guerillas surrendered in 1902. The Orange Free State and the Transvaal were under military occupation until 1906, and they were incorporated into the Union of South Africa in 1910. In 1915, Gandhi returned to India already a hero to the Indian independence movement. In 1947 the British granted independence to India, and that started an unstoppable wave of European de-colonization. In 1948 Gandhi was assassinated by a Hindu nationalist angered by Indian Muslims being given Pakistan. Also in 1948, the elections in South Africa were won by a Nationalist Party dominated by Afrikaners. In the 1950's independence movements and revolutions broke out in several British colonies in Africa. Hoping to avoid such violence in South Africa, the British tried to ease the apartheid policies initiated by the Boers but continued by the British. The Afrikaner Nationalists resisted the policy change to the extreme of unilaterally declaring independence from the British Commonwealth in 1961 as the Republic of South Africa. 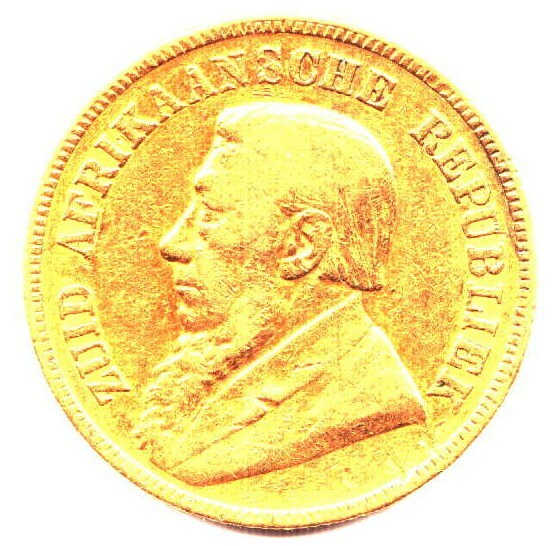 It was the RSA that issued the gold krugerrand bullion coins with a portrait of Oom Paul very similar to the portrait on the coinage of the Z.A.R. Finally, exactly one hundred years after my gold 'een pond' of 'Oom Paul' was struck, everyone in South Africa was allowed to vote, and apartheid ended democratically. The moral of the story is that, when an empire uses democracy as an excuse to pursue gold, whether it's yellow gold or black gold, it can take a very long time for democracy to be acheived.